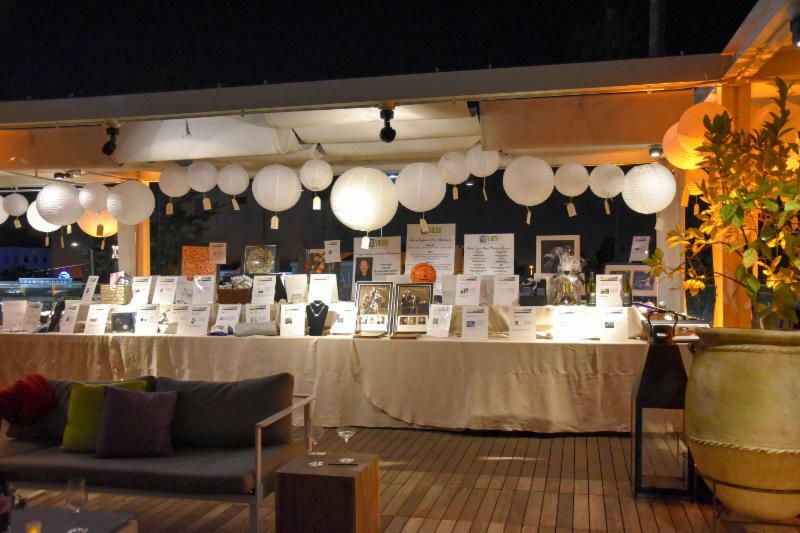 LAYN Gala Draws More than 250 Attendees and Raises Over $300k! 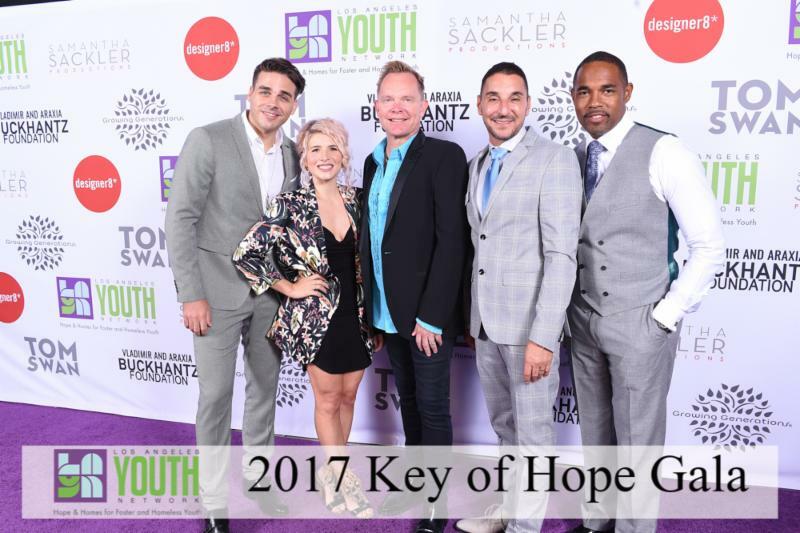 On September 23, 2017, Key of Hope Gala co-chairs John Ryan and Shelly DePalma (pictured, right) alongside honorary co-chairs, Councilmembers Mitch O’Farrell, David Ryu and The Chainsmokers, welcomed more than 250 of LAYN’s friends and supporters to the rooftop of NeueHouse Hollywood, in celebration of the organization’s 32 years of service. Pictured, top of page, left to right: LAYN CEO/President, Mark Supper; Board Members, Hope Biller; Leslie Kaplan, M.D. 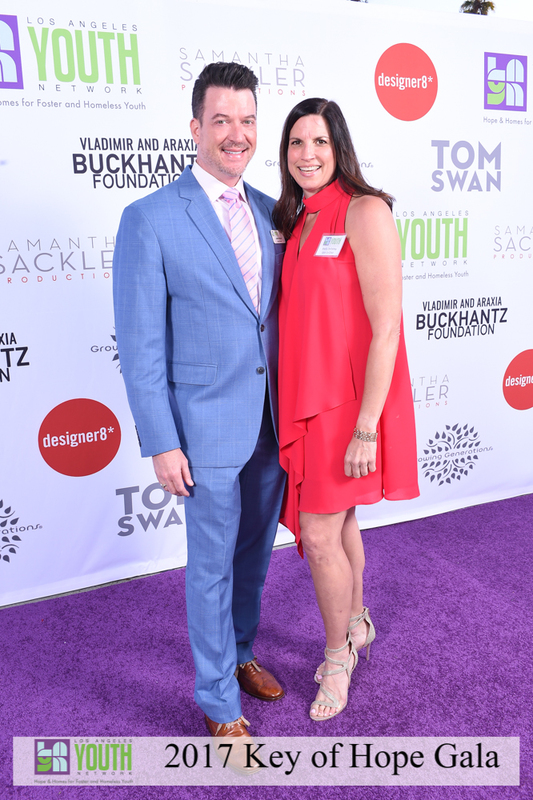 ; Board Chair, Teo Martinez; Board Member Diana Buckhantz; LAYN Youth Jackie and Justin; Board Members, Scott Kay, John Ryan, Ram Cogan and Russell Allyn. (Not Pictured: Board Members, Thomas J. Swan, III and Jeremy Rosenthal). 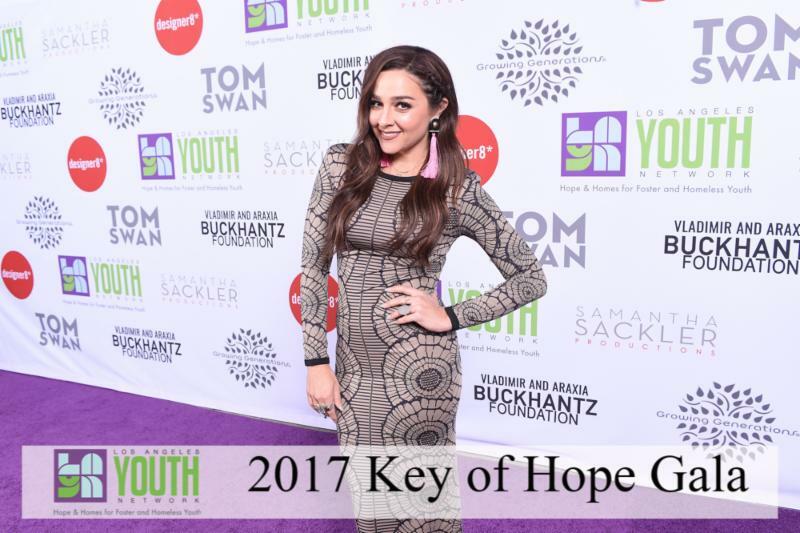 The theme for the 2017 Gala was “together.” The evening included a cocktail reception, silent auction, award presentation, as well as live auction that raised more than $300,000 in support of homeless, runaway, foster and LGBT youth! 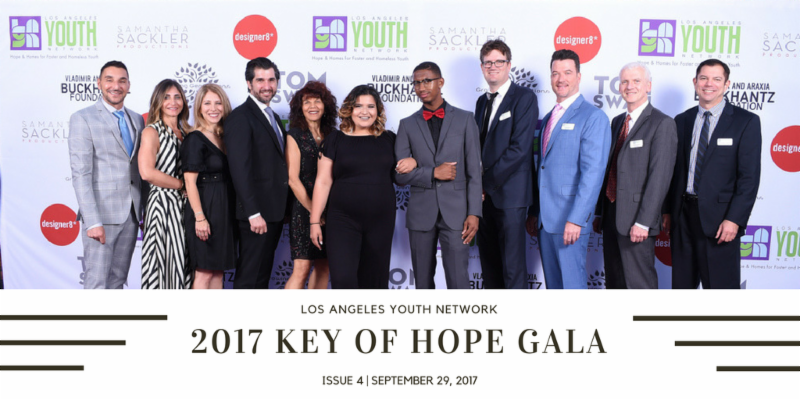 LAYN CEO and President, Mark Supper opened the program before attendees heard from LAYN staff, youth and 2017 Gala honorees. 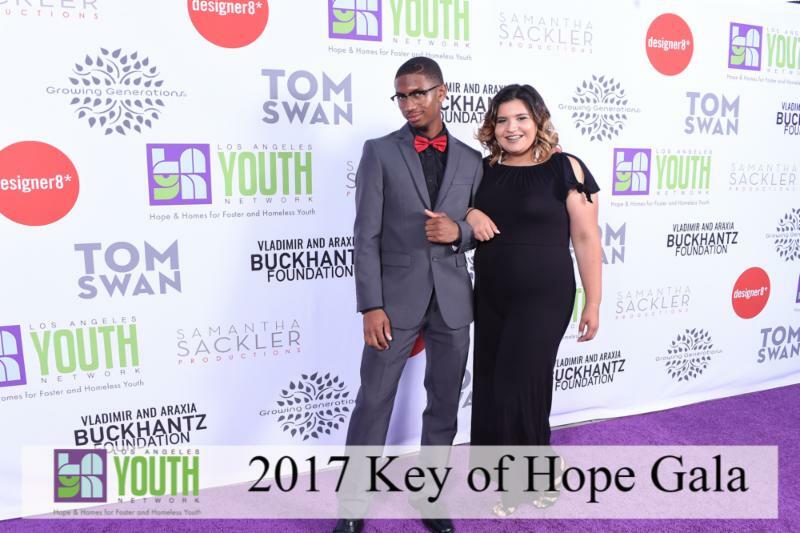 LAYN Youth, left to right: Justin and Jackie on LAYN's signature purple carpet, before sharing their stories as current recipients of LAYN services. Later in the evening, guests were entertained by NBC's The Voice season 10 winner, Alisan Porter (pictured below, left) and witnessed Jason George, ABC's Grey's Anatomy , present long-time friend, Stuart Bell (pictured below, center, left to right: Joey Zehr, Kate Albrecht, LAYN CEO and President Mark Supper and Jason George), with the 2017 Key of Hope Award. 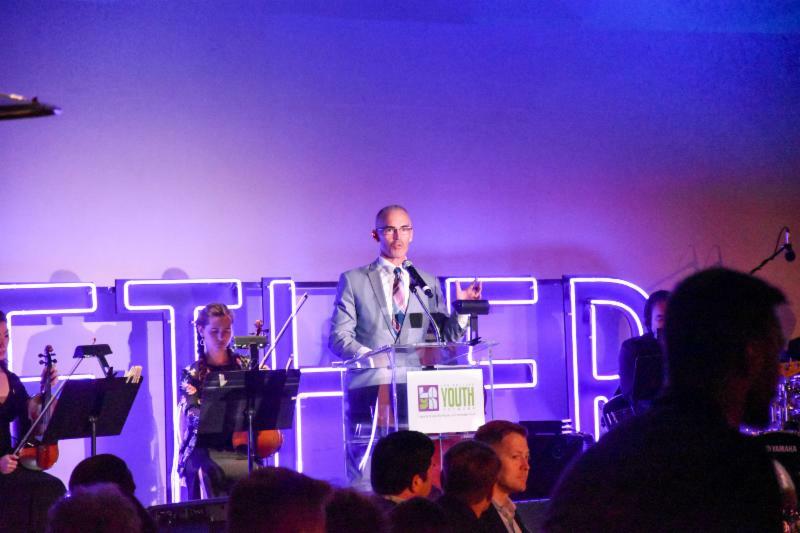 LAYN CEO and President Mark Supper, also announced Kate Albrecht and Joey Zehr as the Community Partner of the Year. Councilman Mitch O'Farrell, closed out the evening (pictured below, right) by encouraging attendees to come together in support the homeless, foster, runaway and LGBTQ youth in our community. 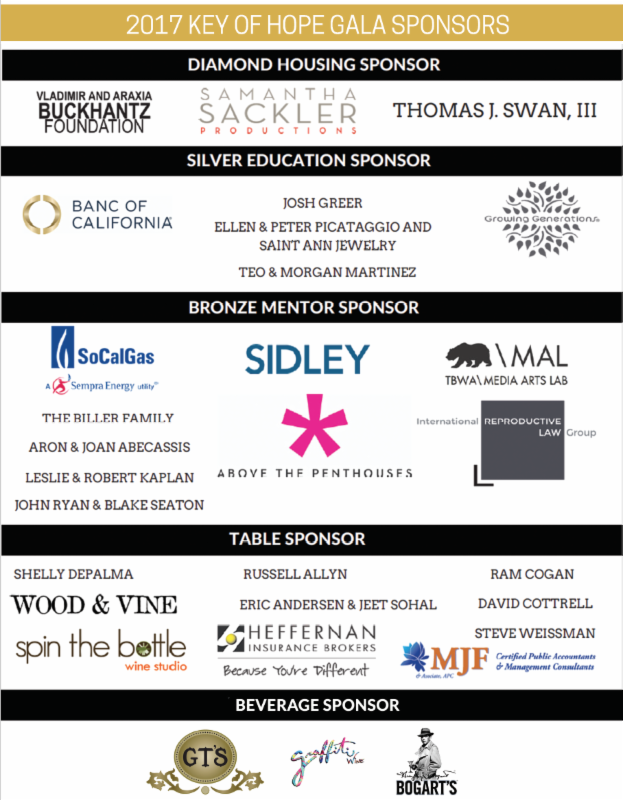 It was truly a magical night and we could not have done it without the 2017 Gala committee (John Ryan, Shelly DePalma, Councilmembers Mitch O'Farrell and David Ryu, The Chainsmokers, Hope Biller, Chris Boone, Diana Buckhantz, Erin Calhoun-Dulaney, John Gile, Angela Leonard, Teo Martinez, Ellen Picataggio, Jeremy Rosenthal, Samantha Sackler, Raynetta Smith and Danielle Vasquez), and the 2017 Gala sponsors and our guests. Thank you all for your continued support of our organization, mission and youth. If you are interested in more information about LAYN or taking a tour, contact development@layn.org .